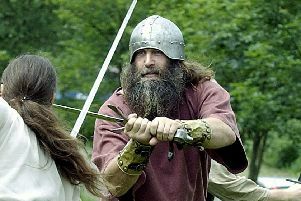 A Cumbernauld woman came face to face with a dashing Highland warrior while out for a walk in the woods. Ann Sweeney and her friend Suzy Smillie were shocked to stumble upon an Outlander film crew in action and as fans of the show were delighted to meet its star. Ann who regularly walks their dog in the woods with husband Andy and their two children Daniel (12) and Cameron (7), knew the series had filmed there, but was still surprised to find herself on set. They waited patiently and were rewarded for their efforts when Sam Heughan – who plays Jamie Fraser in the popular hit show – came over to speak with them. Ann said: “We were both shocked to find them filming in the woods. We always walk the dog along that way and couldn’t believe it when we saw the crew and set. “I love Outlander it is a great TV programme and we waited and watched what was going on for about an hour and a half. The thirteen-episode fourth season of Outlander will premiere in November.